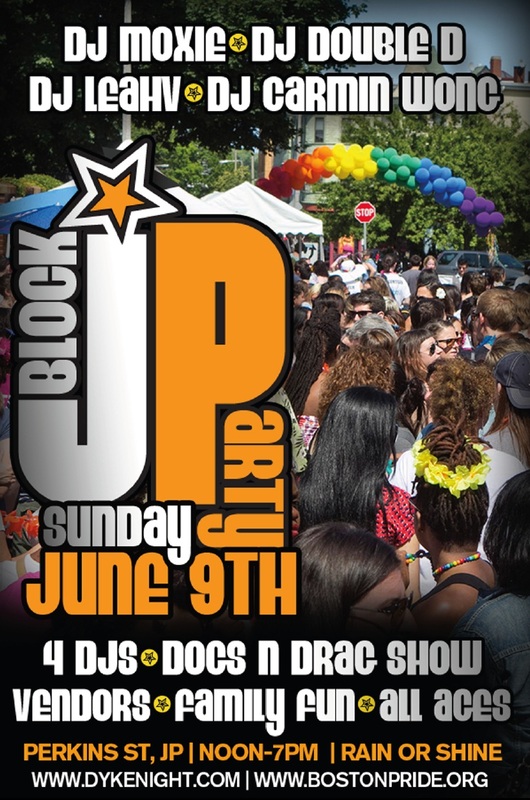 Boston (Date May 23, 2013)– Boston Pride announced today that it is again partnering with LGBT event producer Dyke Night Productions for the annual Jamaica Plain Block Party as part of Pride Week. This year’s Jamaica Plain Block Party will be held on Sunday, June 9th from 12 pm to 7 pm on Perkins Street in Jamaica Plain. The 2013 Jamaica Plain Block Party will feature seven hours of entertainment including live music, Dyke Night mixologists and also many family friendly events. Don’t miss the return of Divas and Dogs Drag Show & Adoption Event featuring rescue dogs available for adoption showcased by some of Boston’s celebrity drag queens and kings and many food and community vendors. There is a $10 donation to Boston Pride and the event will take place rain or shine. The Jamaica Plain Block Party is one of two block party celebrations during Boston Pride Week. Boston Pride Week 2013 will be held from May 31st through June 9th. This year’s theme is “Moving Forward…Proud, Strong, United.” Kicking the week off with The Annual Flag Raising Ceremony, 2013 Pride Week will also include, Pride Day @ Faneuil Hall, Royal Pageant, Boston Pride Parade, Boston Pride Festival, Boston Pride Youth Dance, and Boston Pride Block Party: Back Bay Edition.